A Little Taste of Heaven! Our wildflower liquid and velvety smooth creamed honeys are available throughout the Okanagan Valley, as well as at our own farmgate store. 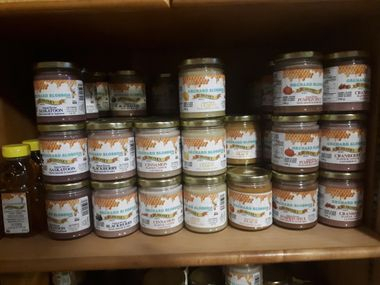 We also do try to have honey in the comb, however because of weather conditions the last two years -- too hot, dry and smoky -- we have not asked our bees to do the extra work of creating all new comb and filling it. Hopefully the weather will cooperate in 2019 and we will again have some of our amazing honey in the comb. We would be happy to fill bulk containers. If you bring your bucket in, we will fill it for $8.00 per kilogram. Our flavored honey is a combination of creamed honey and natural flavoring. Try some on toast, in tea or coffee, or even for baking and basting meat. There is no end to what you can do with flavored honey. Our year-round flavors include Blackberry, Blueberry, Chocolate, Cinnamon, Cherry, Coconut, Ice Wine, Lemon, Lemon Ginger, Maple, Mint, Peach, Raspberry, Strawberry, and Saskatoon. For fall, we will be adding Cranberry and Pumpkin Spice. In the spring, we will be adding Watermelon. If there are other flavors you would like to try, please let us know! Our flavored honey is sold in many retail outlets throughout the Okanagan Valley (check our list of retailers often; it's growing!). You can also pick some up at our local farm gate store for $6.95 a jar. If you can't get here, or to one of our retailers, please drop us a note. Our honey is graded Canada Number 1 honey, certified by the CFIA, so we can send it anywhere in Canada, and around the world (to countries that will allow honey to be imported). What do you do with flavored honey? We get asked this a lot. Obviously, you can use it on your toast, bread, buns, waffles, pancakes, and french toast, but the list goes on. You can also add it to your yogurt, cottage cheese, and ice cream. You can put it in your smoothies, in tea, coffee, and mixed drinks. Some people add it to the water in their SodaMist machines, or will use it to glaze cookies, bread, pastries, pies and squares as they come out of the oven, or to glaze/finish meat roasting in the oven or on the barbeque. Try brushing some of the Maple honey on grilled salmon, or some cherry honey on a ham. The uses are as unlimited as your imagination. Why would you do this to honey? This is our most asked question. People tell us all the time how much they love honey, and that it's perfect just the way it is, so why would they want to even think about trying flavoured honey. It's really simple; it adds an extra flavour to your honey and so it increases the variety of uses for your honey. If you like regular honey, what do you have to lose by trying flavoured honey? You might just find it to be a little taste of heaven. 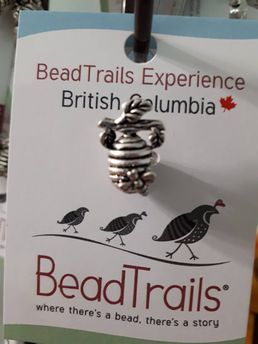 Drop by to pick up our beehive bead to add to your collection, or you can buy your bracelet here to start your Bead Trail journey. 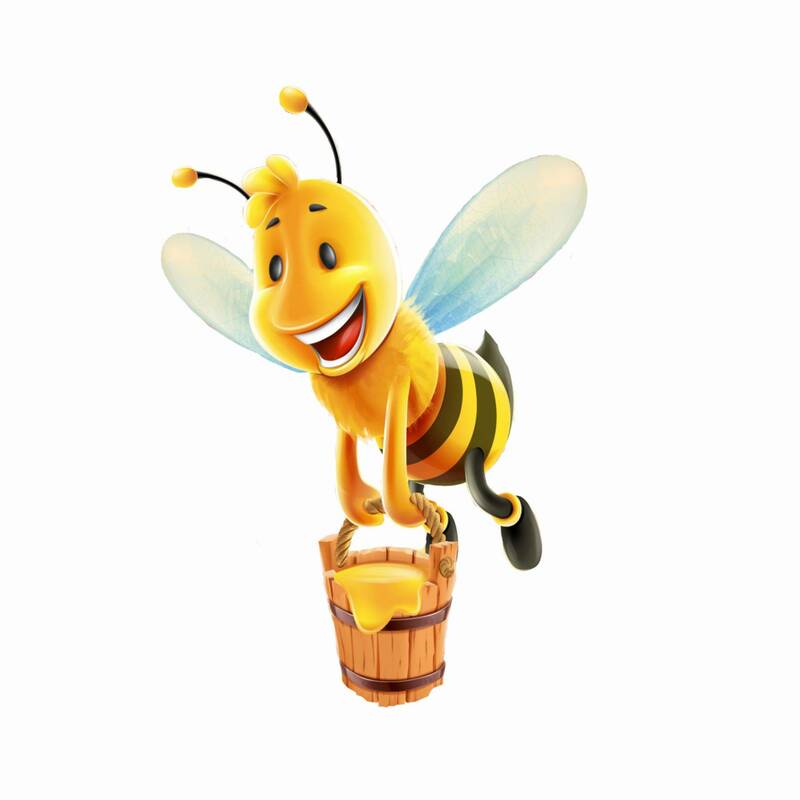 Check out our retail outlets page for more links to the amazing stores that carry our honey products.